Another World: 20th Anniversary Edition is receiving another release, this time in physical form on the Nintendo Switch. Limited Run Games made the announcement the modernised version of this Super Nintendo action-platformer classic would be released next month on 1st February, over on its Twitter account. The game was originally released on the Switch eShop in June last year, following existing releases on the Wii U and 3DS. 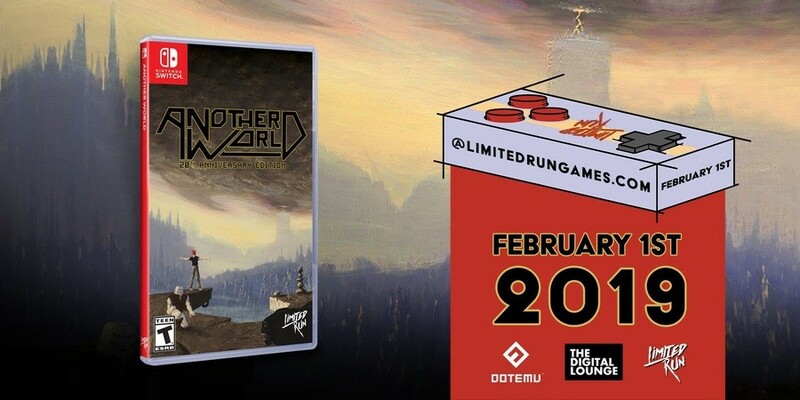 We're pleased to announce the physical edition of Another World for Nintendo Switch, coming to https://t.co/5Lksol4sqo on February 1. As noted in the above tweet, the standard edition will be an open two-week pre-order with more details about the limited collector’s edition to be shared soon. If you haven’t played the 20th Anniversary edition before, it was developed by The Digital Lounge, published by DotEmu and guided by the original creator, Éric Chahi. The game itself is about a young physicist who tears the fabric of reality and is transported to an alien world with many dangers. Will you be adding this retro hit to your Switch library? Tell us below. @sleepinglion I'm sure it was on sale on the Eshop for a few dollars at one point. I played and finished this back in the day on my Amiga, the then again on my 3DS. They’re flogging a dead horse here. As game rereleases go, this has to be on par with Sonic 1 & 2. I might get it, I've never played the game on anything, and it'd be another addition to my Switch physical library. Same deal with Dragon's Lair actually. Far better games that could’ve got a physical release over this. @Rodan2000 wouldn't be Limited Run Games if they weren't milking their cash grabs for all they are worth though. I think I'm just gonna switch back to digital again on indie games when they are 75% off. Getting them physical is hard and expensive. It's 2019, move onto Heart of Darkness or something. @OorWullie it was. The eshop actually has decent sales quite a bit but people still like to complain because Mario isn't 5 dollars or something. I want a swappable cover that says Out Of This World so it displays more like I remember my North American copies from my childhood. Another World has never been the real name for me (even though Out Of This World was the oddity). @kuzronk YES on Heart of Darkness. I loved that game! Finally I can finish my Amiga game. Crossing my finger. Would love to see Another World 2 get a wider release too. Still got the SNES, Sega Genesis, 3DO, and Sega CD physical port of this already so I don't need this one but would be nice to those who never did get to experience this back then. Can't wait to finish my Amiga from the past if I get that far but just the experience is good enough. Wonder what CE will include like the Sony versions? Hopefully the price is 54.99 from LRG. I have it on vinyl. I've played through this on SNES, Sega CD, and Xbox One. I'm burned out on it at this point. It was all I could do to get force myself to get through the Xbox version, and even then it was only because it was a pretty easy 1,000 achievement points. Flashback aged ok, Out of This World not quite as much. No buy. Oh wow. I forgot all about the 3DO release. I still have that. Thanks for the reminder @retro_player_22. Those were the days. I have this on SNES and Wii U (it was 7.99). If you know what you're doing you can beat the game in 1-2 hours. For a physical release in this age I think there should be more content for the price. How many times will they try to feed us part 1? Put the second game on there as well already. Every other company bundles their retro games too. These games were great back in the day but now they are just very average, pretty awkward and not much fun. I have purchased this game so many times, 7 times now that I count, and will GLADLY purchase it again. Sad that I missed out on the Flashback physical edition.